Thailand is one of the fastest-growing retail industries in Southeast Asia. The booming tourism industry is driving the rapid development of the retail industry. As the type of shopping malls gradually become diversified, small and medium-sized community shopping centers and shopping malls for leisure and fashion spring up quickly in Thailand's retail industry, with an increase of 2,000 by 2020. It’s reported that as early as July 2017, Alipay has already entered into vending machines in Bangkok, Nonthaburi and Pattaya. The most popular science spots in Thailand among Chinese tourists are equipped with 24 vending machines that support Alipay payment. When tourists purchase food and drinks, they only need to present the QR code on the Alipay scanning vending machine to pay; Within the next three years, these vending machines will increase to 500. KASIKORNBANK (KBank, Kaitai Bank), Thailand’s leading banking group, recently posted on the official website that the bank has set up cooperation with Alipay, Thai retail business company and SUN 108 Co., Ltd., an operator of vending machines to launch these vending machines, which are expected to provide services for 9.8 million Chinese tourists this year. General manager of SUN 108 Vathit Chokwatana claimed that the most popular tourist attractions in Thailand such as Bangkok, Nonthaburi, and the central shopping mall in Pattaya are equipped with vending machines that support Alipay. Like China, Southeast Asia is enjoying higher standards of living thanks to economic development, which in turn is leading to more diverse consumer preferences in the beverage industry. With the cost of labor rising as well, vending machines are increasingly coming to the fore as a beverage sales channel. Fuji Electric is in the process of having its subsidiaries in Thailand and Singapore roll out sales and marketing activities for the purpose of expanding its vending machine business in the Southeast Asian market. The company began assembling and producing beverage and food vending machines at its Thai production subsidiary in July 2014, going on to establish a vending machine operation company in Thailand in June of 2016 in order to further develop the vending machine market.Now, with Kubota withdrawing from the vending machine business, Fuji Electric intends to expand its activities in this sector by reinforcing its foundations in Southeast Asia through the acquisition of PTMS and attend the first vending show in ASEAN region-Vend ASEAN 2018. Vend ASEAN, ASEAN (Bangkok)Vending Machine & Self-service Facilities Expo 2018, was successfully held at IMPACT in Bangkok during 19-21,September. More than 100 companies from China, Thailand, Singapore, Malaysia, Japan, Hong kong took part in Vend ASEAN, representing around 130 brands. During 3 days, Vend ASEAN co-located with RetailEX ASEAN attracted more than 5,000 attendances from over 28 countries, who express the interest in vending and self- service facilities and systems. 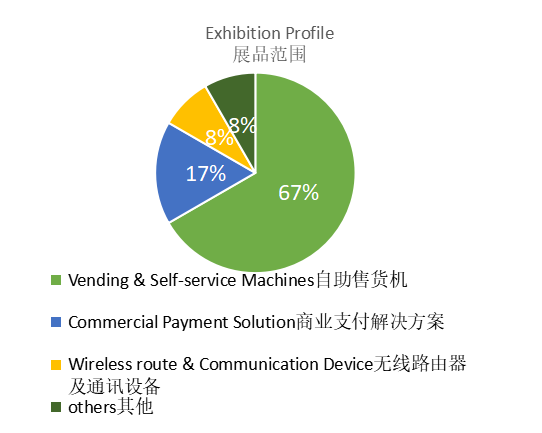 And According to the on-site exhibitor survey, the exhibitor analysis as follow. As the first and only vending industry trade show in South East Asia, Vend ASEAN maintains a good cooperation with International organizations, like EVA, CONFIDA, ANEDA, PSV, VASA, AVA and so on. As the organizer of Asia's most successful Vending machine & self-service trade fair in China, Guangdong Grandeur International Exhibition Group has successfully held the first and only vending show in Bangkok Thailand in 2018, with the aim to create a good platform for vending machine and self-service facilities industry in Southeast Asia. A total number of 500,000 invitations, tickets, briefings, etc will be sent to targeted visitors. Exhibition news will be released by more than 200 mass media, online media, professional media and news media to attract buyers. 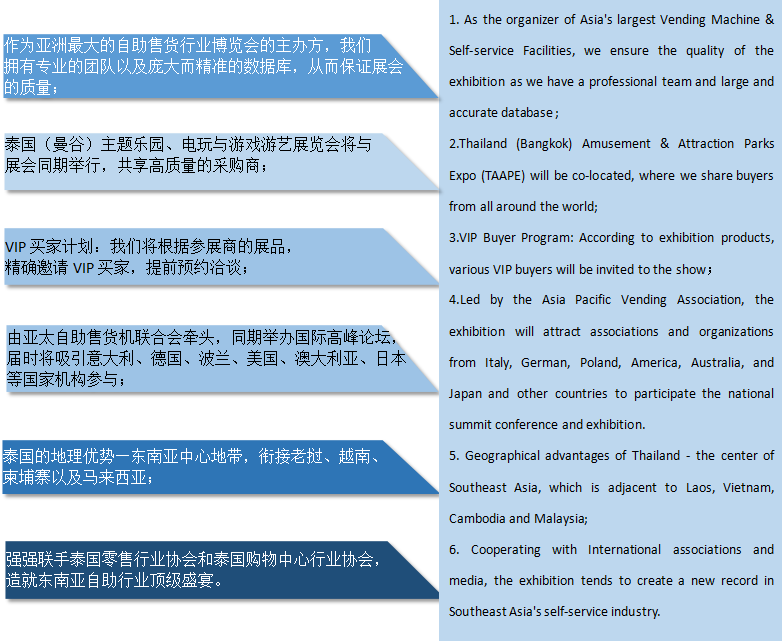 The organizing committee will participate in similar and related vending exhibitions at home and abroad to promote exhibition information so as to attract more professionals. 8.Office coffee machines & ingredients. 5.Software developers, content developers, complete equipment hardware providers, turnkey system providers, equipment renters, communications / network connectivity technologies, public Internet access technologies, equipment maintenance and remote monitoring, technical support, integrated services,Industry Consulting, Publications, Media. 1、Fill in the application form and send it to the Organizing Committee by fax, mail or email after affixing the official seal to confirm the exhibitor’s participation. 2、Remit the exhibition fee to the Organizing Committee to reserve the exhibition space. 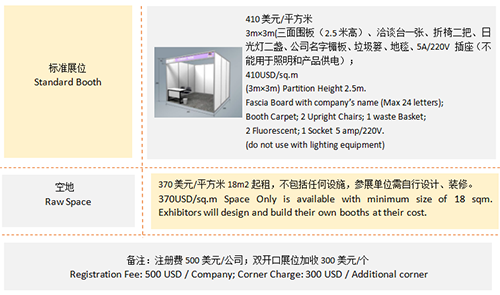 3、When exhibition fee has been collected, exhibitors manual will be sent to exhibitors.